Declan Rice (right) and James McClean (inset). James McClean has hit out at players who want to use Ireland as a 'stepping stone', telling them to 'sod off and play for someone else'. 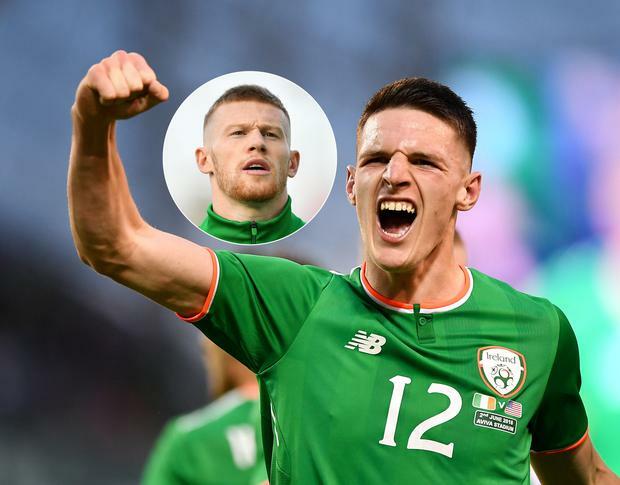 Last month Declan Rice opted so switch his international allegiance from Ireland to England, despite a lengthy underage career in green as well as three friendly appearances for the senior team. Rice's defection generated massive debate, with McClean the latest to weigh in during an interview with Tony O'Donoghue on RTÉ. In his statement explaining his decision, Rice referred to how he is both a proud Irishman and a proud Englishman, something that McClean takes exception to. "He said he was a proud Irishman. Then he said he was a proud Englishman. If he's both... good luck to him but I don't buy it," he said. McClean also defended Ireland's win over Gibraltar, and said that he is hoping that the crowd get behind the team when they play Georgia at the Aviva Stadium tonight. "It means everything pulling on this jersey," he added. "The night we beat Bosnia [in the play-offs to make Euro 2016] in the Aviva, that was special. Beating Austria away, the night in Cardiff, great memories over the last few campaigns. "It'd be nice to create some new ones as well. When a new manager comes in, everyone seems to up their level in training trying to impress. Hopefully we can make it a great start by getting two wins from two. "It's easy to sit home when you're not playing in those conditions and say, 'well Gibraltar are ranked where they are, you should just steamroll them'. If you're asking me do I care, well I don't. We went and got three points and that was the job we had to do going there, so job done. "The fans have been great, The ones that fill the stadium are the true supporters and they've always got behind us. We're not stupid. We know we need to perform on the pitch to get as much as we can from the crowd as well."